The sum total or quantum of units or individuals: The numerousness of the voters at the election exceeded what the candidates had expected. Relating to a collection of all kinds of coins or various types of currencies: Stewart's numismatic assortment of proof sets and minted silver and gold pieces impressed many visitors at the exhibition. 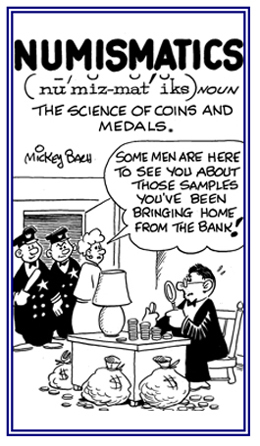 The study or collection of species (coined money), circulating medium (currency), and sometimes, related objects; such as, medals: Mark attended the international convention for numismatics hoping to determine the value of the gold medal which he inherited from his grandfather. © ALL rights are reserved. 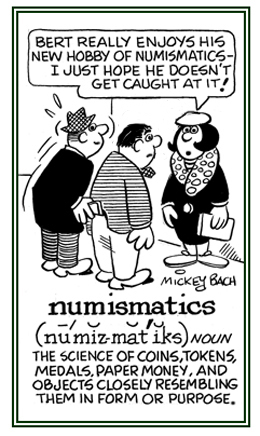 A person who collects and studies coins and legal tender (currency): As a numismatist, Norbert attends many exhibitions in order to find and to purchase more precious silver and gold metals, some of which are used as money. Private Identification Number: The ATM (automatic teller machine) required Mason to input his PIN before he could proceed to make the withdrawal of the money that he had indicated. Determining or ascertaining the aggregates or rations of something again: Warren was asked to re-enumerate the items that he had purchased to be sure nothing was missing. Fay was re-enumerating the reasons for not going on the trip with her friends. Something or someone that is in excess of the usual, necessary, or regular amount: The royal couple received supernumeraries of gifts for the special celebrations. The store seemed to have a supernumerary of sales personnel because there were so many salesclerks available to help the customers when they came in. 1. Conveying an overabundance of the normal or prescribed number of presentations: There were supernumerary or excessive repetitions of broadcasts about the killings of the women and children by the insane soldier. 2. Beyond what a regular body or staff consists of: Paul was hired as a supernumerary assistant, or substitute, for anyone who could not show up for work because of an illness or for any other emergency situation. 3. 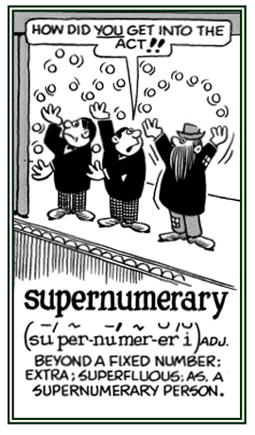 Exceeding the required or desired number or estimate; superfluous: The supernumerary tornadoes caused great destruction and loss of lives in several areas. 4. Descriptive of a person who appears in a play or film without speaking lines or as part of a crowd; a walk-on; an extra: Jennifer and the other people who were in the background of the street scene of the movie were supernumerary actors. © ALL rights are reserved. 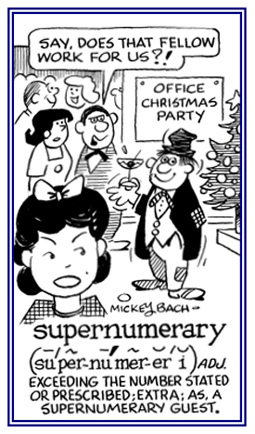 A reference to being excessively large in copiousness (quantity): There are supernumerous people who are unemployed and looking for work. There were supernumerous masses of golf-size hail falling during the storm. Translation: "Witnesses are weighed, not numbered." That is, in case of a conflict of evidence, the truth is to be sought by weighing the credibility of the respective witnesses, not by the mere numerical preponderance on one side or the other. Translation: "Where the witnesses who testify are in equal number (on both sides), the more worthy are they to be believed." Translation: "Evidence is to be weighed, not enumerated." Vehicle Identification Number: When Mitch registered his new car, he had to provide the VIN before he could obtain the new license plates.